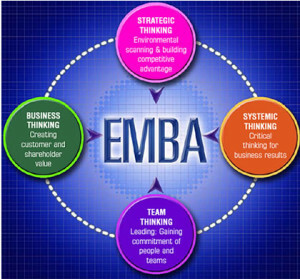 Many working in management and looking to progress in their career are looking into executive MBA programs. So what is an executive MBA? It is similar to more traditional MBAs, only tailored more specifically for those who have been in the game for awhile already. The executive MBA program has a different schedule, a tighter curriculum and greater opportunities for networking. Many executive MBA programs require five years experience in a supervisor role before they can apply. This program is for those who want to take it up another level. Executive MBA programs are designed so that you are with the same set of students throughout the majority of your classes. According to Forbes, this can be great for building relationships and networking, but only if you mesh well with the current set of students. By checking in at class orientation and observing the styles of fellow classmates, you can get a better idea of who you’ll be participating in the program with, and you can hold off until the next batch if you want. However, this will postpone your graduation, and one must be careful with this approach. Often employers pay for their employee’s tuition for an executive MBA, either in part or in full. This can be a huge incentive to go through with the program, as full time MBA students can find it extremely difficult to work full time while pursuing their degree. Obviously, if an employer is paying for you to get an executive MBA, you will want to consider whether or not you plan to end up staying there for awhile, as the expectation is that you use your newly gained skills to benefit the company. Remember that even with an executive MBA, you are still subject to the same whims of the economy. You can still have a vulnerable position even if your company has paid for your executive MBA program, as employment decisions are based on individual performance and the effect on the overall performance of the company. While those with an executive MBA will definitely have a leg up over other candidates with a similar set of qualifications, experience is still king and performance is the most reliable measurement of economic viability. Time commitment is a major factor in whether or not an executive MBA program will benefit you in your future career. Be sure going into the program that you will not be held back due to family obligations or other restrictions. Class schedules are tailored for those who are working and so will likely take place on weekends. Most courses offer only one option for time. Overall, an executive MBA program may be the right path for you if you meet the requirements and are ready to move ahead in your career. Consider you current employer and whether or not staying with their company is worth the investment they put into your continued education. Executive MBA programs can offer major advantages in terms of tuition coverage, networking opportunities and quality curriculum.